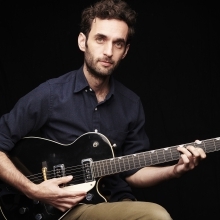 Julian Lage contains many guitar personae within his slender frame. A prodigy from an early age, the now-30-year-old has spent his career sliding fluidly between projects like the languid cool jazz of his work with saxophonist Dayna Stephens, folksy duets with David Grisman, and thoroughly modern fare as with his recent recording of John Zorn compositions. 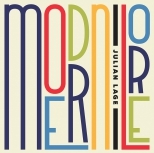 When he takes the lead, as he does on Modern Lore his new trio album recorded with drummer Kenny Wollesen and bassist Scott Colley, he gives the many sides of his musical personality a turn in the spotlight. And the result is a snappy, multi-colored affair that gives him ample room to show off his unmatched skills with his chosen instrument. For much of the album, Lage looks for ways to expand upon the mode of the country picker. Opener “The Ramble” takes its title very seriously, evoking a bumpy and aimless drive through some dusty landscape. But it’s rhythm and pacing also give off a spirit of Chet Atkins somehow guesting with peak ‘70s-era Genesis. If you can imagine “Watcher Of The Skies” reimagined by a country swing band, you’re getting close. “Wordsmith” leans much more jazzy but returns to this bluesy, Duane Eddy-like feel that adds a nice noir-ish sliver to its otherwise pleasant atmosphere. Elsewhere on the album, he and his band write songs that feel like adult contemporary pop hits just waiting for a vocalist to help take them to the charts—if Stevie Nicks were a part of the process, ”General Thunder” could fit neatly into the running time of Fleetwood Mac’s Rumours without anyone noticing— and more meditative explorations (“Revelry” and “Pantheon”) that give Lage and Colley ample room to stretch out and let their notes hang in the air a little longer. Modern Lore even drops a little experimental number in the mix. But just a little. Still, that small diversion, titled “Earth Science,” is a blast of sharp electricity that resets focus before the album winds to a close. Lage sticks hard to one jagged repeating guitar phrase, while the rhythm section collapses into multiple heaps behind him. So when Colley switches to bowing his bass towards the end of the track, the effect is almost comforting. And a great lead-in to the album’s closing number. The itchy feeling of “Earth Science” may cut through the otherwise rosy glow of the record, but it’s also what helps turn Modern Lore from a good album into something closer to great. The comfort that Lage and his bandmates evince needs those small shakeups to keep from devolving into something pleasant but unengaging. The trio toes that line at times on this new release without completely falling into pure background fodder. It’s a delicate balance that only the best players could attain. Time will tell if they can maintain it.